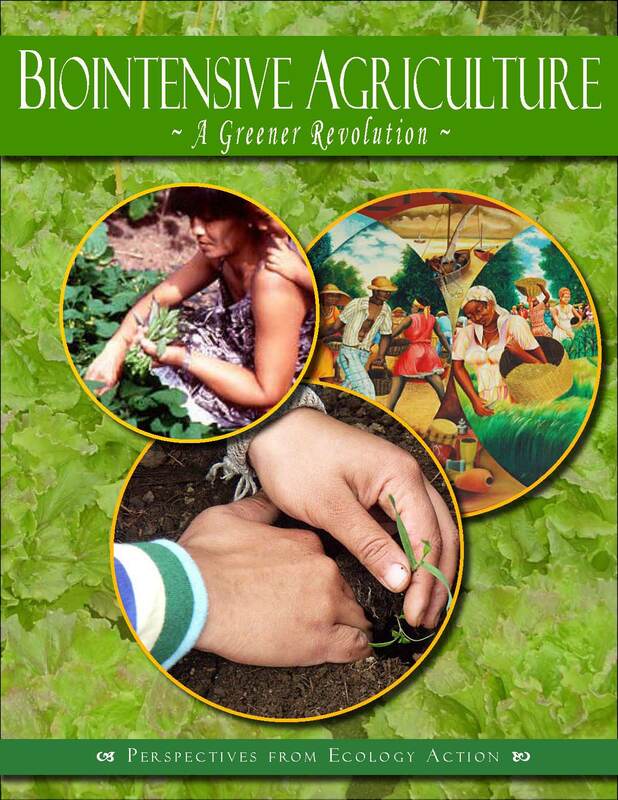 The Farmer's Mini-Handbook: GROW BIOINTENSIVE Sustainable Mini-Farming by Margo Royer-Miller was first published in 2011. Since then, due to popular demand, we've translated it into 7 other languages (French, Spanish, German, Turkish, Hindi, Russian, and Portuguese). You can download all of them here, for free. New in 2018: to celebrate our eBooklets coming online this September, we're releasing an enhanced version of The Farmer's Handbook: one that includes 8 full-color teaching posters that beautifully illustrate the guiding principles of the GROW BIOINTENSIVE method. but we ask you to make a donation help keep our work growing. Donations help us teach people around the world to grow healthy food and fertile soil, and allow us to create beautiful and useful publications like this one for the whole world to use. Click Add to Cart, below. (enter 0 if you do not wish to donate at this time). Traducción al español de la 8ª edición, versión 1.0. 253 páginas. © 2019 Ecology Action. Spanish translation of the 8th edition, version 1.0. 253 pages. © 2019 Ecology Action. Toleo la Kiingereza ©2012 Ecology Action. Kiswahili translation of the 8th Edition/2012 version 1.0. 283 pages. 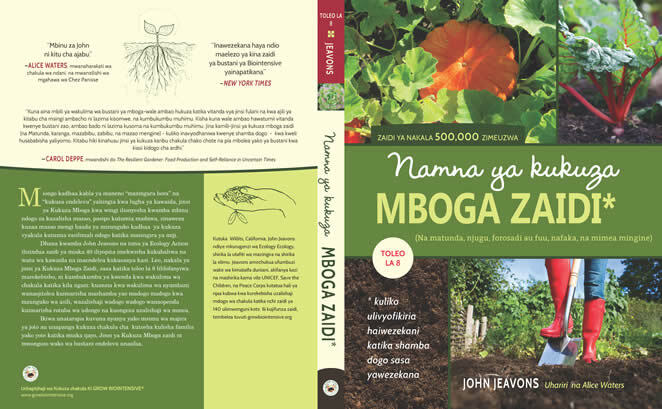 English version ©2012, Kiswahili version ©2019 Ecology Action. The following booklets were written by John Jeavons, Ecology Action staff and apprentices, and contain basic information for learning GROW BIOINTENSIVE method and other techniques. All English language eBooklets will be online by the end of October 2018. Information sheets to follow soon! 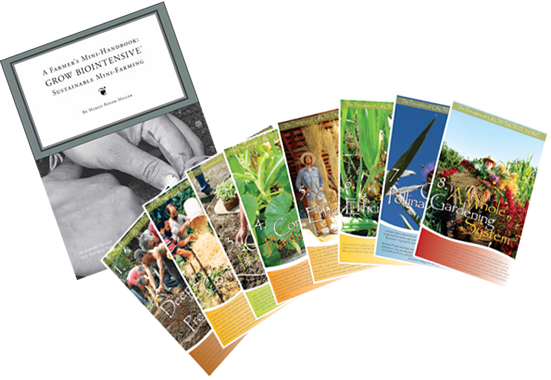 Print versions of our booklets are available for in-person purchase by workshop, class, and internship participants only.We apologize for this inconvenience - since our online store Bountiful Gardens closed in 2017, we no longer have the ability to fulfill print orders for the general public. Explains what Ecology Action is doing and why. Well footnoted. Takes cucumbers as an example of a crop history and goes through 7 years of work, from 1973 to 1979, during which yields in our research gardens increased from 140 to 400 pounds per bed. An excellent introduction to mini-farming and the variables which can be examined for greater yields. 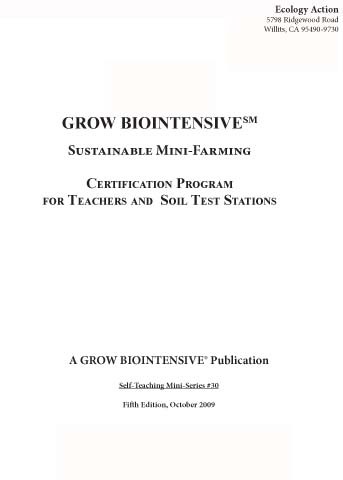 Contains step-by-step instructions for conducting comparative tests for spacing and yield (with optional water monitoring) for soybeans, an important protein crop. A paper given at The Second International Conference on Small Scale Intensive Food Production, reporting on the worldwide efforts of Ecology Action and others. A “working paper” designed to present basic information on the tropics. Contains a large bibliography. EA staff, 1984, 140 pp. We’ve had increasing requests for a book on how to grow your own fertilizer from common materials. Over 90 of tables on the fertilizer potential of common home, garden and farm materials. Many places in the world (US also) simply cannot easily get commercial or prepared fertilizers. Get independence in your garden. Not currently available in electronic format. How to grow all your own seed in the smallest possible area in your own backyard. Maintain optimum health and genetic diversity in your seed stock! 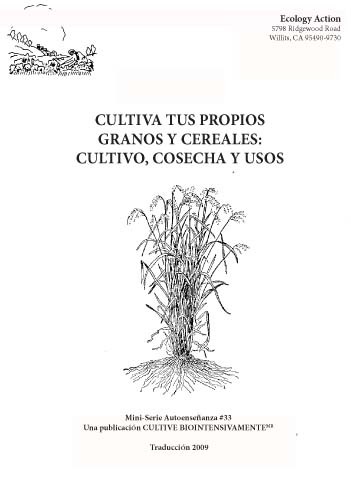 Includes information on vegetables, grains, cover crops, seed exchanges, and seed co-operatives, plus a bibliography. Essential tables on crops and their seed-saving characteristics. is available as a PDF. Currently it takes a minimum of 10,000 square feet to feed one person in the U.S., and often 16,000 square feet to feed one person in the Third World. This booklet gives a step-by-step approach on how to start sustainably growing all your food, a small income, and compost crops in as little as 2,100 square feet. 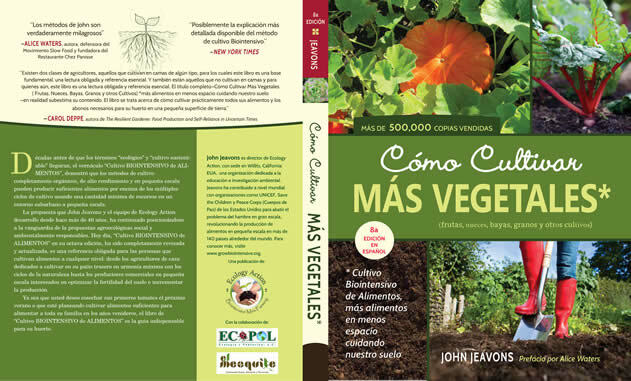 Assumes you've read How to Grow More Vegetables, One Circle, Backyard Homestead. This booklet grew out of Gary Stoner’s work with the Menos y Mejores project in Tula, Tamaulipas, Mexico. It includes an exploration and complete nutritional analysis of a typical family diet. We can learn much about providing for ourselves from our friends in Tula. Available in both English and Spanish - please specify when ordering. A consideration of how to get the most from your crops through foliar feeding, with several easy-to-make-at-home recipes for sprays. Techniques for improving your garden and gardening. What to look at when setting up your garden, ways to improve your garden’s performance, and how to listen to what your garden is telling you. Flowers enrich our lives, are often quite useful for vegetable growing by serving as food sources for pollinating insects, can be part of a good business, and many are even good to eat! Cultivation of dried and cut flowers, information on edible flowers, and economic data on mini-farming flowers commercially. Illustrated. This booklet answers many of the most commonly asked questions about our work and the purpose and direction of our research. Our Ecology Action publications contain a wealth of information - here is John’s plan for the best way to use them to make your learning easier. What to read when, plus suggested supplemental readings. Create your own curriculum. John Jeavons, 1989, 13 pp. Micro-farming in a global and a national context--shows the contribution it can make to solving many of our current environmental and agricultural problems. An excellent and concise summary on growing compost crops to improve your soil’s fertility. Highlights ten exceptional crops and their respective advantages, with tips on how to plant and compost them. What specifically sustainability is, with notes. A thorough analysis of a vegetarian Kenyan diet. A fully sustainable three bed model, based on our Booklet 14. Profusely illustrated with charts and references. Based on Booklet 14, this complete course was developed through our workshops on the one-bed learning & teaching model. Gives detailed cultural instructions for many crops that we have found successful in our research garden. Good materials for planning and record keeping. Louisa Lenz-Porter, 1995, 40 pp. How to grow most of one person’s medicinal herbs in as little as 50 square feet. An herbal “medicine cabinet.” of 24 common, easily grown herbs is described in depth. Instructions, recipes, and bibliography take an easy approach to an enjoyable activity. Sample 50-sq-foot bed with ideas for personal modifications. Sustainable diet and dairy production, for a family with one cow. John Beeby, Booklet 29, 2nd ed. 2013, 168 pp. For thousands of years, farmers were able to predict the agricultural value of land by observing the plants that grow on it. This book shows you how to optimize your garden's health and productivity, simply by observing the plants growing in your garden. Learn what natural fertilizers lead to best garden health. Fully revised and updated edition. Includes color photos. Details for those who are interested in the requirements and process for becoming Certified Teachers of Biointensive techniques. The 2009 edition of Booklet #30 is available as a free PDF! Introduces in detail the concepts behind the design of a sustainable mini-farm that provides compost material for soil fertility, food for a balanced diet, and crops to market for a small income, all in the smallest possible area. Includes 10 forms to be filled out with data from your own garden site and nutritional needs and takes you through the process that will end in a sustainable design for your own specific situation. The process is one used in our workshops that has evolved over many years... a practical tool for your home garden! Revised version of discontinued booklets 10 and 23. This book details our research into producing the highest quality compost from crops grown in your own garden. All that we have learned in the past 14 years has been included. At last! Basic grain raising and harvesting on a small scale, appropriate for a home garden. How to grow and use barley, oats, cereal rye, triticale, wheat, amaranth, corn, millet, quinoa, rice, sorghum and teff. Carol Cox is the Garden Manager at our Ecology Action Research Mini-Farm in Willits, and has been growing all kinds of grains for many years. A working paper. Food for the Future, Now! A Survival Garden Plan. There is a difference between responding to panic and planning for the future! This booklet provides carefully constructed garden plans to provde a basic, nutritionally complete diet for one person, increasingly healthy soil, and even seed for replanting. Based on the GROW BIOINTENSIVE method to insure sustainability. This booklet is for gardeners who have limited water for the growing of their food, either those in naturally dry areas or in areas of extended drought. 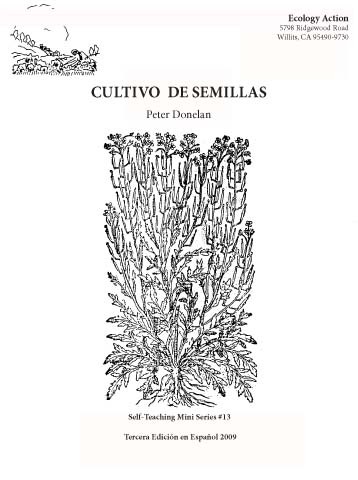 If you want to find new ways to maximize the efficiency of the water you use in your garden, this book will help. 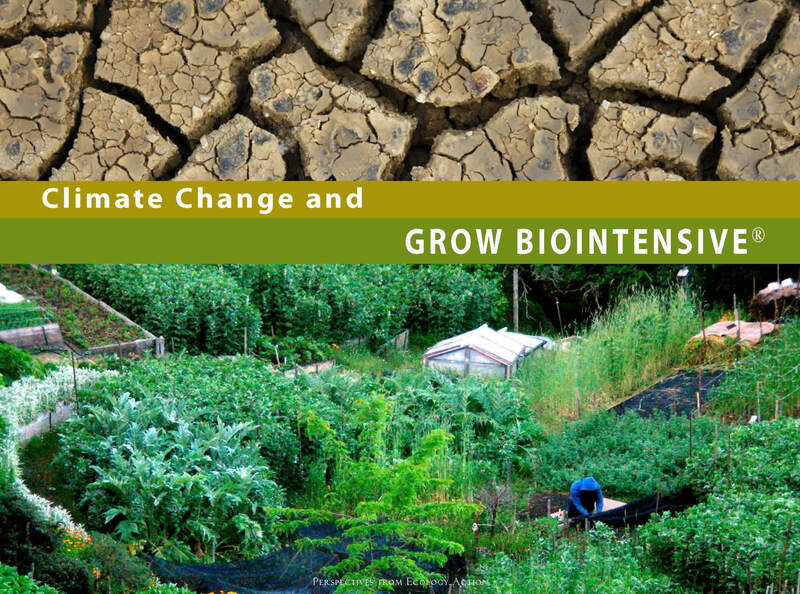 It briefly explains how water acts in the soil, quantifies the water savings of growing food biointensively and describes ways to minimize the water you need. It then covers a number of ingenious ways to harvest rainfall, add water effectiveness to your soil and notes methods to use for storing water. This booklet is our newest plan, based upon 40 years of solid research, for growing all your food, compost and a modest income on a little as 3,300 sq ft of growing beds. This is based on conservative intermediate-level GROW BIOINTENSIVE yields. It has been designed for longer growing season areas with warmer nights, as opposed to Booklet 14, and similarly uses a 3-bed plan as its basis, which can then be scaled up to a full mini-farm. Contains delicious recipes based on the crops grown. Among the benefits potential for the Biointensive Sustainable Mini-Farming method are higher yields, lower water consumption, less fertilizer. It is fairly straightforward to weigh produce, measure water use, and keep track of fertilizers. It is not so easy to evaluate the total input of energy in farming systems. Steve Moore, director of the Agroecology Program at Elon University in North Carolina, has been investigating this particular aspect of the Biointensive system. His new booklet in the EA Self-Teaching Mini-Series, Energy Use in Biointensive Food Production, evaluates the different forms of energy that contribute to food production. They include the calories of labor, the calories embedded in the tools we use, and the calories used in getting the food to our plates—processing and preserving. Two crops, onions and flour corn, serve to illustrate how the use of energy is calculated with as little as 6% the energy being used in biologically intensive practices compared with conventional ones. Be sure to check out the energy efficiencies of fermentation food preservation, including Sauerkraut! it's rewarding to see the progress made. The fact that the GB system is being used successfully in 152 countries worldwide in diverse climates and soils, and that the demand for the training is still so high, leads us to believe that our 46 years of work are being very beneficial. More importantly, it gives us hope that GB can be an integral solution everyone can use to have the healthy food, and the healthy lifestyle they deserve—while living in balance with the Earth! By remaining flexible, while giving our best efforts towards strengthening our programs and advocating for the GB system globally and locally, we believe we are helping the most people catalyze an improved life for themselves! Mary Zellachild, former Communications Director for Ecology Action provides us with this excellent summary of work to date and plans for the future. Jeff Smith and John Warner, 2000, 12 pp. Sweaty gardeners at our research garden have been grateful for the solar-heated shower in the garden, and we have had requests for the plans…so here they are. Written by the two master builders who installed ours, these are detailed plans with drawings, a materials list, and complete instructions on building and siting. Sondra Blomberg, 1991, 16 pp. A journey of one person from a good job in industry towards an organic Biointensive community-supported economic mini-farm and an integrated, simple, spiritual way-of-life. Included are questionnaires to assist others in their journeys. Many of these booklets are also available in other languages. We will be converting them into electronic format and placing them online in 2018. The following information sheets were written by John Jeavons, Ecology Action staff and apprentices, and contain basic information for learning GROW BIOINTENSIVE method and other techniques. All of Ecology Action's English language information sheets will be added as they are converted to electronic format. Print versions of our information sheets are available for in-person purchase by workshop, class, and internship participants only.We apologize for this inconvenience - since our online store Bountiful Gardens closed in 2017, we no longer have the ability to fulfill print orders for the general public. Coppiced and pollarded trees are managed so that they regrow after cutting, taking less time to grow more wood than if you planted new trees. This paper discusses suitable species for coppicing, and how much land is required to sustainably harvest enough wood to provide fuel for a year. Includes a bibliography and resources for learning about coppicing. Kale, Tree Collards (Brassica oleracea var. acephala) are the "tall cousins" in the cabbage family. They grow upwards like a tree, and some plants can reach up to 12 feet tall! Find out how to grow and use these amazing plants. You can now download PDF versions of some of our other publications! by John Jeavons and Carol Cox, 2007 107 pp. 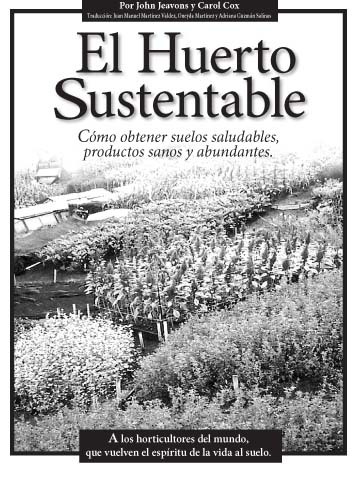 Based on the best-selling How To Grow More Vegetables..., El Huerto Sustentable is a simpler book for those just beginning to garden or those who need less information for the gardening they are doing. Take advantage of two decades of GROW BIOINTENSIVE food-raising experiences from people everywhere as you create a highly productive, resource-conserving mini-farm at home, with its own thriving ecosystem—an environmental solution for the nineties … and beyond. The newly revised 2009 edition of Ecology Action's self-teaching mini-series is now available -- for free! -- as a downloadable PDF. is available as a PDF (1.33MB file). (Traduction par Anaïs Rimaud) Traduction française de la 8ème édition, version 1.0. 257 pages. French translation of the 8th edition, version 1.0. 257 pages. © 2017 Ecology Action. Portuguese translation of the 8th Edition/2012 version 1.0. 283 pages. English version ©2012, Portuguese version ©2014 Ecology Action. 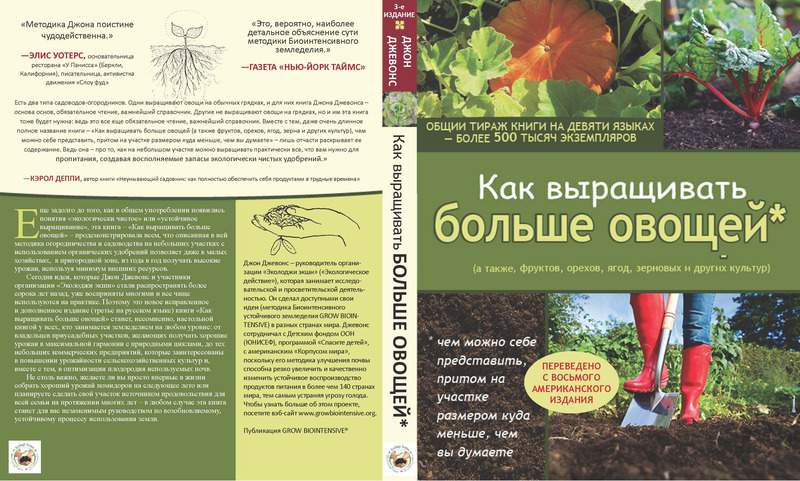 Русский перевод 8-ого издания John Jeavons How to Grow More Vegetables. © 2012 Ecology Action. Russian translation of the 8th Edition, version 1.0. ©2012 Ecology Action. Нажмите здесь, чтобы получить электронную книгу.